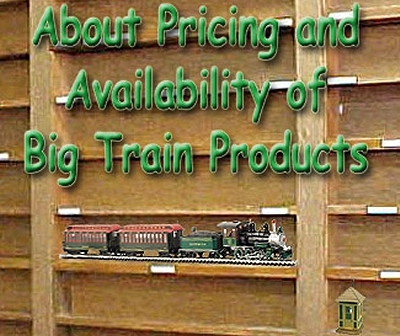 I have observed the dynamics of the model train market for many years, and even written articles about them. But since I started posting product recommendations online, I have learned first-hand just how quirky the market can be, just how fast prices can go up or down, and just how quickly a product that seemed widely available a month ago can virtually disappear. Since I posted my first "buyer's guide" in 2004, I have been contacted by hundreds of readers who waited until the last minute to buy, then found that some product I recommended had disappeared from almost everyone's shelves only a few days before. They also discovered that the web sites and voicemail systems of many model train suppliers became so congested that they were difficult to navigate after December 12, and impossible to navigate after December 18. When assembling my buyer's guide pages, I try to recommend products that not only meet my own quality and usefulness standards, but which seem to be widely available. Each Christmas season, though, I find myself rebuilding links and replacing suppliers for certain products as one after another ran out of stock. Some products which should have been widely available disappeared altogether. Of course, you would expect supplies of high-demand products to run low during the holiday season. But the truth is, model trains and related accessories come and go all of the time. Although I will try to help you find any particular item you need (unless you wait until December 15 to start panicking), I cannot absolutely guarantee that any particular product will be available next week, much less by the time you need it. From the perspective of anyone selling trains, the answer is simple: If you think you want it, buy it now. But I'm much more interested in informing than in selling, so I've included an explanation for the vagaries of this industry. Hopefully this will help your decisions to be "educated guesses" at least. Model Trains Have Long Development Cycles and Slow Return on Investment - Manufacturers make and distribute model trains in huge "batches." The batches are planned 12 to 24 months before the products are expected to hit the shelves, then more often or not, the instructions and any molds needed are sent overseas to start the manufacturing run. At the same time the manufacturers take orders from distributors and other huge customers, so they have some idea how many of a particular item they are likely to sell. Because "setup" can be half or more of the cost of producing a product, the manufacturer may add another 50%-100% to the orders they think will be popular. That way they don't run out prematurely and have to face either losing sales or rushing into another manufacturing run. By the time a run has terminated, and the products are on their way back to the US, the manufacturers are already working on the next product. They won't order another batch of the first product until it starts disappearing from the warehouses altogether, and they can start accumulating orders for it again. This may take weeks or years, and manufacturers aren't always very good at guessing which it will be. If a manufacturer feels that they've accidentally glutted the market, they may never order another batch of that particular product (even one that seemed popular at first). Also, many "collectible" products, such as the subscription trains offered by Hawthorne Village®, are never reordered. Why Waiting Too Long to Purchase Is a Gamble - With the exception of the limited edition stuff, two-thirds of the pieces that are currently available are just as likely to be around a year from now. But, because of the "spurty" manufacturing described above, a product that has been available, even gathering dust for years in stores and warehouses across the country, may suddenly become unavailable, period. The only problem is that neither you nor I have any way of being entirely certain which product will be available indefinitely and which product will be gone tomorrow. That's where waiting too long to buy what becomes a gamble. For my part, as the "owner" of this page, the BigTrainStore™ and related buyers' guide sites, I periodically check the supplier links. If a product shortage seems to be temporary, and I can't easily link to another supplier with the same product, I will leave that original link up so that you can get your name on the supplier's waiting list if you want. If I determine that a product is on the verge of extinction, I will remove it and attempt to replace it with a similar product that seems to be widely available. I will also attempt to answer all e-mail questions (including those about availability) in a timely manner. But the caveat is that any product on any page may change price or become unavailable at any moment, and I may not be able to help you find one at any price. The first year I posted product recommendations, I was contacted by several customers who wanted particular trains that they had waited too long to order. Because I didn't realize how time-consuming it would be, I took it upon myself to search every supplier and competitor (and even some collector sites) looking for those trains - fruitlessly, as it turned out. Unlike the big hobby publishers and store chains, I still make it a point to answer every legitimate question I get by e-mail. But nowadays, I get so many e-mails in December, that I usually don't get through all of them before March. So if you have a question about trains for Christmas, don't wait until Christmas Eve to ask it. And don't even think about calling my house - here's an irony - the people who've been most persistent in tracking me down, even to the point of finding my work or cell number and calling me at my day job have never either followed my recommendations, or bought from one of my recommended suppliers. The first year I posted a Buyer's Guide, I included my home telephone number, because I was trying to be helpful. But then I spent Christmas Eve arguing with people who had literally waited until the last minute and called me because they couldn't get through to the hobby shops in their own city. A Note about Pricing - I have removed pricing information from all product descriptions because I could not begin to keep up with my suppliers' price fluctuations. In several cases, prices have actually gone down, so I was inadvertently showing a higher price for a product than you would actually have been charged. I apologize in advance for making you "click through" to the supplier's site to check pricing and availability, but at the moment I have no way to keep that information up to date on my sites. Finally, I hope that you have enjoyed taking a look at what is available, and learning what will work and what will probably not work for your particular needs. Please let me know if you have any concerns or suggestions for improvement. Note: BIG Indoor Trains™, BIG Train Store™, Family Garden Trains™, Big Christmas Trains™, and Trains and Towns™ are trademarks of Breakthrough Communications (www.btcomm.com). All information, data, text, and illustrations on this web site are Copyright (c) 1999, 2000, 2001, 2002, 2003, 2004, 2005, 2006, 2007, 2008, 2009, 2010, 2011, 2012, 2013 by Paul D. Race. Reuse or republication without prior written permission is specifically forbidden. Big Train Store(tm) is a participant in the Amazon Services LLC Associates Program, an affiliate advertising program designed to provide a means for sites to earn advertising fees by advertising and linking to amazon.com.